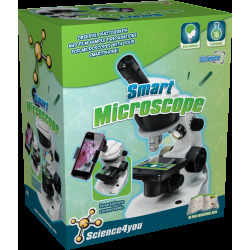 Take your first steps into science with our Smart Microscope! Observe, photograph and film a sample preparation for Miscroscopes with your smartphone and become a real scientist. You will enjoy discovering the little things around us. Explore beyond what humans can see unaided! How to observe, photograph and film fantastic sample preparations for microscopes with your smartphone. 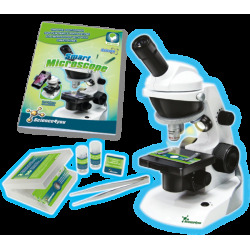 How to generate bacterial growth medium in order to examine under a microscope. How to extract DNA from a banana. How to analyse under a microscope protozoa and onion cells in different solutions. How to prepare temporary mounts with the smear technique. 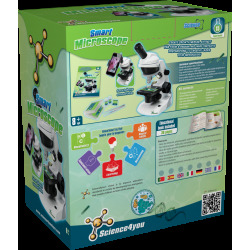 It includes up to 15 experiments for kids as well as an educational book with 36 pages.